Ulnar nerve except for the "LOAF muscles"
All but 2 (flexor carpi ulnaris and a component of flexor digitorum profundus) are innervated by median nerve. fractures leading to a positive OK sign). All extensors of the wrist are innervated by the radial nerve (posterior interosseous branch). 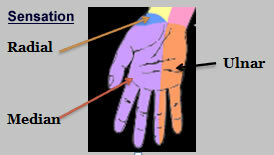 Median nerve entrapment as it traverses through the carpal tunnely causes carpal tunnely syndrome.